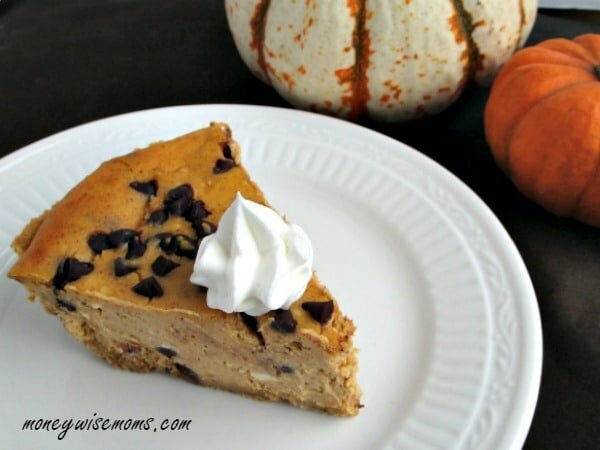 This Pumpkin Chocolate Chip Cheesecake has become a family tradition. We make it at least once every holiday season. Trust me–you need to make this! It’s inevitable. As much as I love baking with fall flavors like pumpkin, cinnamon, and nutmeg, it’s a given that chocolate will make an appearance. This cheesecake is a great way to include it–the chocolate chips add texture to the creamy cheesecake and even more flavor! 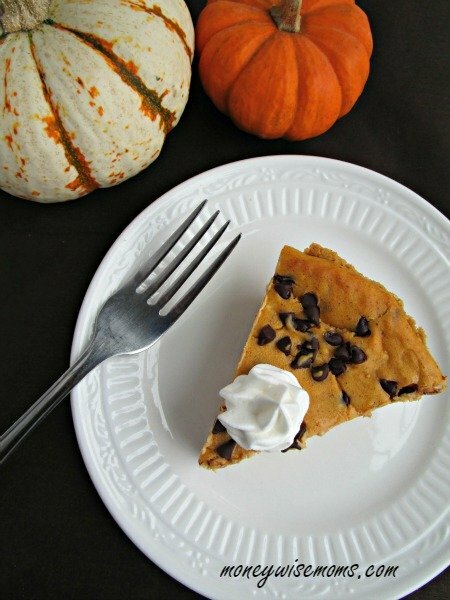 We just love this easy Pumpkin Chocolate Chip Cheesecake recipe. This is a wonderful dessert to present at a holiday dinner or party, since it’s simple to make but the WOW factor is so high. 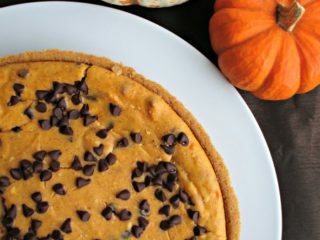 This Pumpkin Chocolate Chip Cheesecake recipe is quite easy, even though it takes over four hours because of the chilling. A word of warning–you do not want to cut it short and eat it warm. I may have done that once. It is gross. The chilling is what gives cheesecake its texture, so just be patient. It’s worth it. Why is it that we only eat pumpkin in the fall? I’m going to keep a can in the pantry and down the road in the spring instead of going all lemon I’m going to break out the pumpkin. Who’s with me? Beat cream cheese, sugar, pumpkin, vanilla and spices in a large bowl with mixer until blended. Add eggs and beat just until blended. 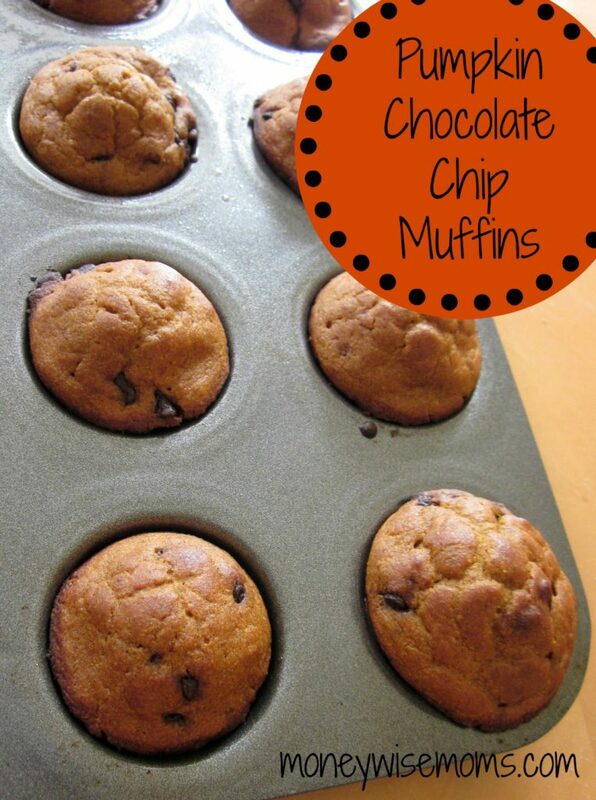 Fold in 1/2 cup mini chocolate chips. Pour into crust and sprinkle 1/4 chocolate chips over top. Bake 40 minutes or until center is almost set. Cool. Refrigerate for at least 3 hours. Top with whipped cream just before serving. Linked up to Full Plate Thursday at Miz Helen’s Country Cottage, What’s Cookin Wednesday at Buns in my Oven, Thanksgiving Recipe Roundup at Gooseberry Patch, Inspire Me Wednesday at Adventures of Mel, Creative Muster Party at Fluster Buster, and Tasty Tuesdays at CreativeKKids. This looks amazing! Definitely pinning. This looks and sounds so yummy! I need to make this!! This look easy, delicious, and beautiful. Adding it to my list for the holidays (and pinning too). I am definitely going to try this! I love that it uses a graham cracker pie crust rather than a springform pan. Sounds delicious, thanks for sharing! I know! I’ve done my own crusts in a springform pan, but it adds a whole other level of something to go wrong. This is easier! yes yes yes, this looks ahhhmazing! Anything pumpkin and you got me..but add in my other favorite, chocolate chips, and I’m in heaven! I’ve made pumpkin cheesecake before, but never thought to add chocolate! I just love a fun cheesecake in an interesting flavor – I would love to try this one over the holidays. Thanks for sharing!!! Your Cheesecake is awesome! Wishing you and your family a bountiful Thanksgiving and thanks so much for sharing with Full Plate Thursday! Thank you, Miz Helen, and have a wonderful Thanksgiving! 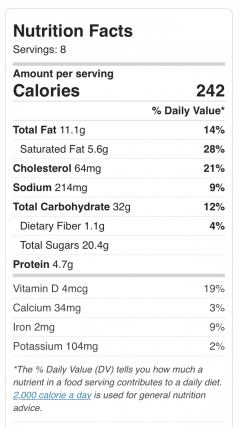 Yum- pumpkin cheesecake sounds like a win to me! 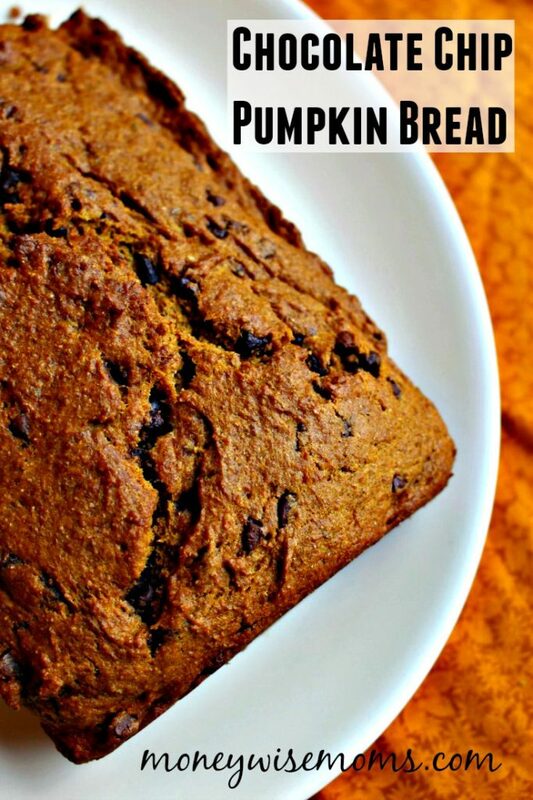 And, yes to pumpkin all year long! Thanks for sharing! That looks absolutely fabulous! Such great flavors combined! And you’re so right on waiting out the time for it to chill completely. I’ve made a few cheesecakes and it’s hard to wait, but essential. I ordered cheesecake once at a restaurant and no kidding, they put it in the microwave before bringing it to me! Ack!! 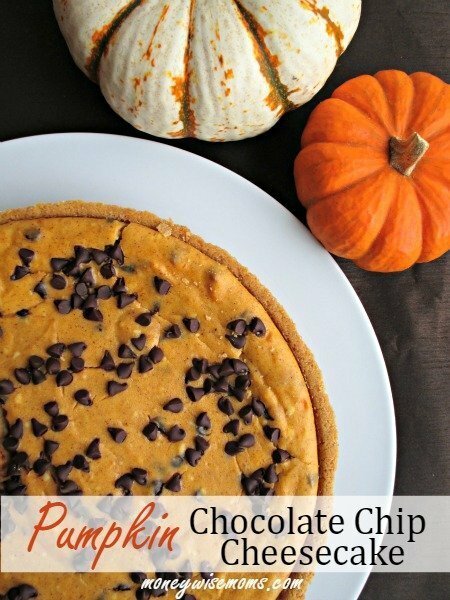 Oh goodness, chocolate chips…in pumpkin pie…..how good does it get!!! Thanks for stopping by #OMHGFF to share this recipe!